The Yoruba cultures hold within it powerful words, rhythms and strong proverbs that rebukes and at the same time draws you back to it. 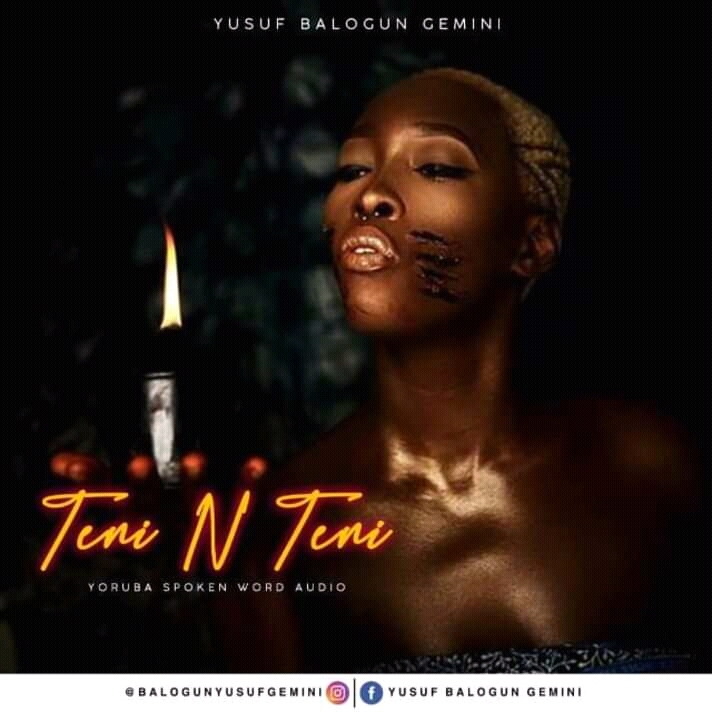 Teni N Teni slow but sonorous best reminds one of the Yoruba films and cultures which was popularly propagated by the Late. Chief Hubert Ogunde. The Poet, Yusuf is a mastery of the Yoruba culture, words and proverbs different from the ones in Lagos here. He begins by acknowledging the Elders before introducing himself. That is not popular these days, especially among the educated or Lagos Yourba citizens. This very act demonstrated by Yusuf can only be done by a well groomed and true son of the Yoruba land. Yusuf unleashed his first attack on the supposed educated elites with focus on the Yoruba Sons that have chosen to neglect their origin which is mostly traditional. Mostly because of their newly found religion, he asked why suddenly the parents that groomed these men are now scornfully looked at because they worship their traditional gods. This part of his message or rant if you like is a call to action for Yoruba Sons and Daughters to come back to tradition they once despised. He wondered why the white men that brought the modern religion to us spend lots of money to buy those carved portraits and if they were not useful. The black man is source of his own problem because he does not have self confidence in his own beliefs. He is constantly trying in vain most times to be like the white man. The Poet goes on to address the issue of tribal marks which is now labelled a sin and of which most Yoruba's now regard to as punishment. He asked when Tribal marks became a sin which the only solution is to behead the person(s) that has it on his face. He referenced a lady named ADETUTU ALABI who uses her tribal marks as a source of beauty instead of a of shame with. He goes on by extending his invitation to the listener to come with him to the palace of Alaafin Of Oyo who is a living legend that has tribal marks carved on his face. The tribal marks makes him looks radiant and he is proud of it. The Yoruba film industry was not spared in the attack, the film industry has become a shadow of itself and has lost its glory. But let us face the fact, the emergence of social media has made most of the Yoruba films lost its once celebrated audience. The language used mostly in these movies are in English and that has made someone like me lost interest in most of their movies. Most of the films are shot in the city while neglecting the original setup of shooting the movies in villages. Most of the story lines are flawed, and if they ever try to speak the Yoruba Language, the actor/actress or speakers most times are not fluent in it. One wonders what the industry holds as a custodian of the Yoruba Language and culture in general. Using that as a model, one wonders why the English language is made compulsory as part of the requirement for admission in our tertiary institutions. While shoving the Yoruba language, it is a call on the concerned authority to as a matter of urgency make the Yoruba Language compulsory in our primary, secondary and tertiary institutions. Yusuf went personal by attacking his detractors who accused him of not doing poetry. This maybe due to the fact that he does not use English for his spoken word poetry. Their own understanding of poetry is limited to only English language, but there are so many posts the world over who reels out Poem not in English language but their own language. The spoken word in all may seem like a bitter attack to those mentioned but in all, it is a call on the custodians’ of the Yoruba culture, the Elders, Parents to remind their wards of the importance of the language and culture to the advancement of the Yoruba nation. Yusuf ends the poem by rendering praises on himself, with words of eulogies that could wake the dead and make the prodigal sons and daughter of Yoruba extraction come back to their home with reference to the owners of the land. Generally, it all depends on the approach the listener listen to this Yoruba spoken poetry from. The poet invested his time and energy to the success of this work. The poem serves as a message that hurts the listener and at the same time point out possible solutions to the problems addressed. It is a plus to the Yoruba nation that a young man like Yusuf Gemini Balogun has decided to take up the challenge of promoting and showcasing the values of our rich cultures.